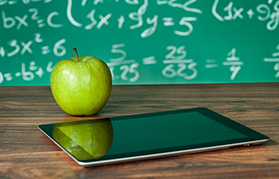 The median annual wage for secondary school teachers in the Tucson Metropolitan Statistical Area (MSA) was $39,010 in 2018. 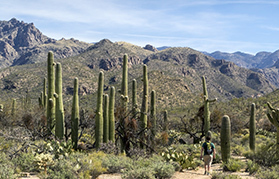 This ranked Tucson last out of 12 western MSAs. The San Diego MSA led with $80,640—more than twice the median annual wage for secondary school teachers in Tucson. Secondary school teachers in Tucson were paid an average of 10.1% more than the median wage for all occupations ($35,430). 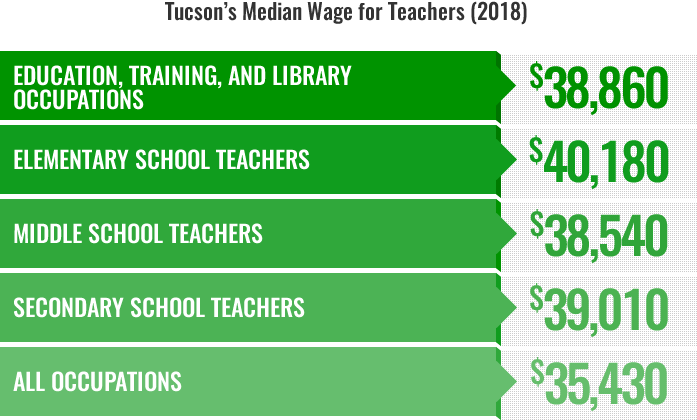 Among Tucson’s educators, middle school teachers were the lowest paid, while wages for elementary and secondary school teachers were slightly higher. All three were significantly below state and national levels in 2018. Research has shown that providing competitive wages for teachers has a significant effect on the decision to choose teaching as an occupation and remain in the field. Others have noted that insufficient compensation for teachers, in relation to other occupations, affects turnover and student success. Providing teachers with opportunities for advancement means that they are more likely to remain at the schools they were trained in, resulting in better learning outcomes for students, and return on investment for districts. Low wages, among other factors, lead the most qualified teachers to seek better opportunities, often located in wealthy suburbs. The resultant teacher sorting leaves low-income urban districts with the least qualified and experienced educators. Children of families who lack geographic mobility are consequently affected the most. In 2018, the median wage for teaching occupations in the Tucson MSA was $38,860. 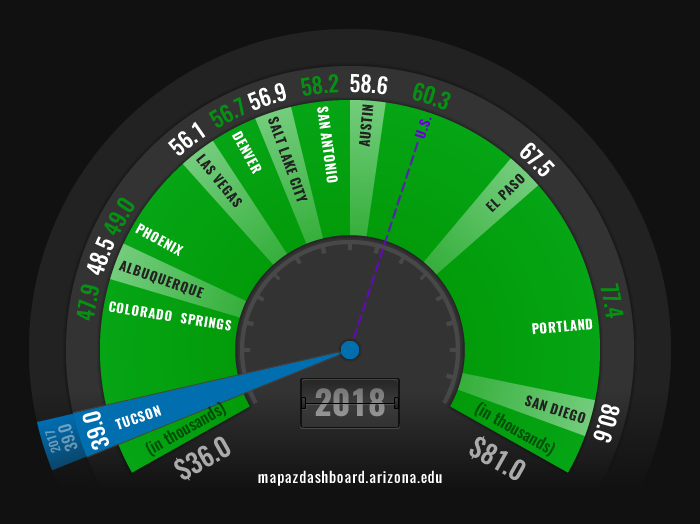 This level, which includes all teaching and related professionals, was more than $3,000 higher than the median wage for all occupations in Tucson ($35,430). Elementary school teachers were paid the highest, followed by secondary, then middle school teachers when compared to the median wage for all occupations in 2018. Keep in mind that the all-occupations median wage includes a large number of occupations with low education requirements. In Tucson, teacher wages are relatively low when compared to other professions that require at least a bachelor’s degree. Wages for elementary, middle, and secondary school teachers were lower in the Tucson MSA than in Arizona or the U.S. in 2018. The median annual wages in Tucson for elementary, middle, and secondary teachers were $40,180, $38,540 and $39,010, respectively. Teachers were paid slightly higher wages statewide at $43,720, $42,710, and $46,940, although still considerably lower than the U.S levels. Nationally, the median wages for elementary, middle, and secondary school teachers were $58,230, $58,600, and $60,320, respectively. There is substantial variation in wages for secondary school teachers across the 12 metropolitan areas. 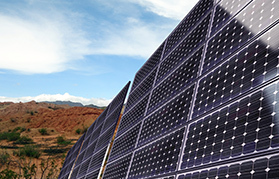 Part of the variation may be driven by differences in the relative cost of living. Thus, adjusting for these cost of living differences may give us a different picture. The fuel gauge below shows secondary school teacher wages adjusted for differences in the cost of living. 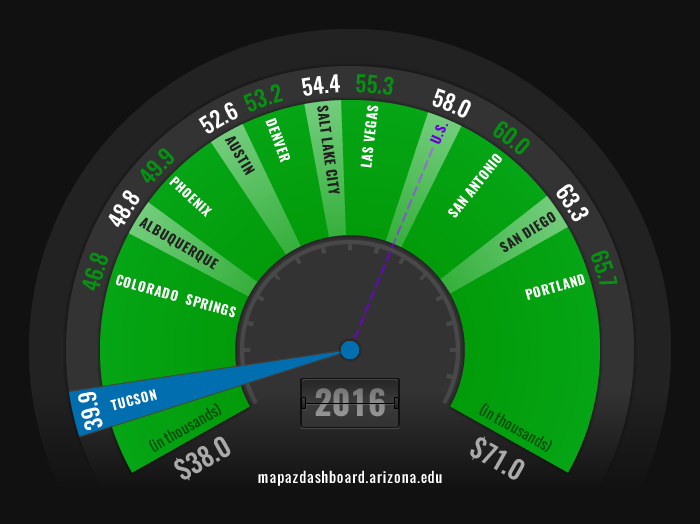 Note that Portland ranked first while Tucson still ranked last. In 2018, the wage for secondary school teachers in the Tucson MSA was 10.1% more than the median wage for all occupations. 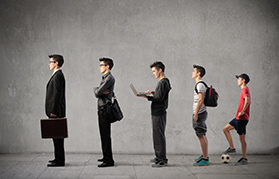 It is important to keep in mind that the median wage for all occupations reflects both low and high skilled workers, with a large number of occupations requiring little education. In contrast, nearly all secondary school teachers have at least a bachelor’s degree and many have a graduate degree. Thus, we expect teachers to earn wages above the median for all occupations. 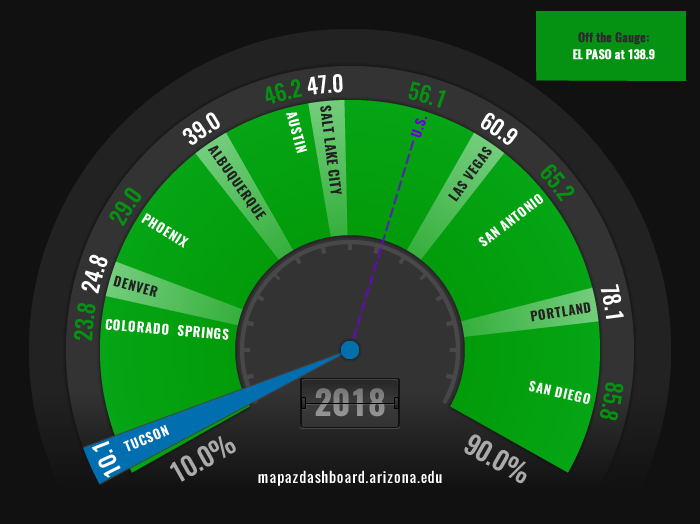 Note from the fuel gauge below that secondary school teachers in Tucson ranked last among the 12 metropolitan areas on this metric. Teacher wage data are from the Bureau of Labor Statistics (BLS) Occupational Employment Statistics (OES). 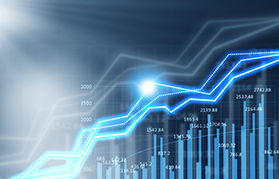 OES data are derived from a semiannual survey of establishments in the U.S., which examines full and part-time workers in all nonfarm industries. Wage estimates are based on a series of six panels of survey data collected over a three-year cycle. 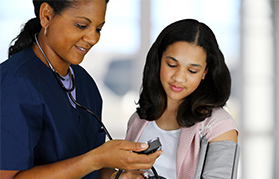 Wages include base pay, allowances, incentive pay, commissions, bonuses and tips; it excludes back pay, overtime, severance, employer costs for benefits, and tuition reimbursements.